This section is discontinued now. Chapter 3 is confirmed to be in the making, and detailed updates are provided to pledgers in the related Kickstarter campaign. 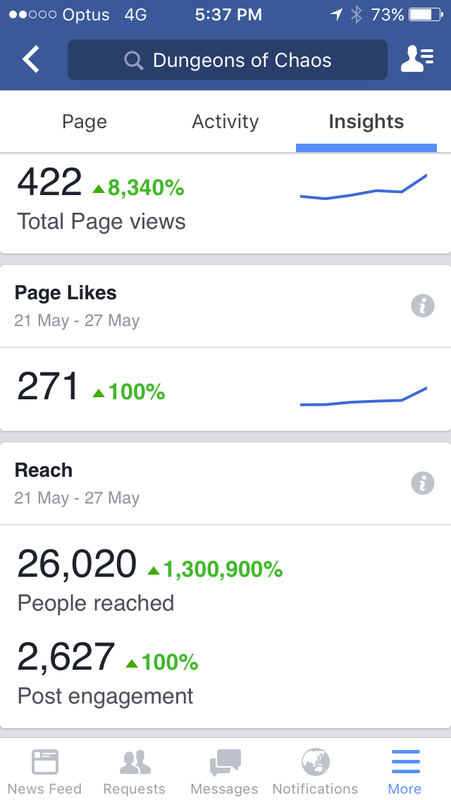 In certain intervals I will also update the Facebook community about progress. I am also working on a ‘the DARK SIDE’ spinoff (see details HERE). Here I will post some pictures and ideas that are making their way into the next updates. Seeking feedback and suggestions (reply below). BTW, I know it is not spelled ‘peak’ but once the whole webpage is named that way, links and referrers would break so this is the page’s name now. Finally on a roll getting content churned out. Icy valley, Catacombs, dragon den, mountain path, hermit hut now done. 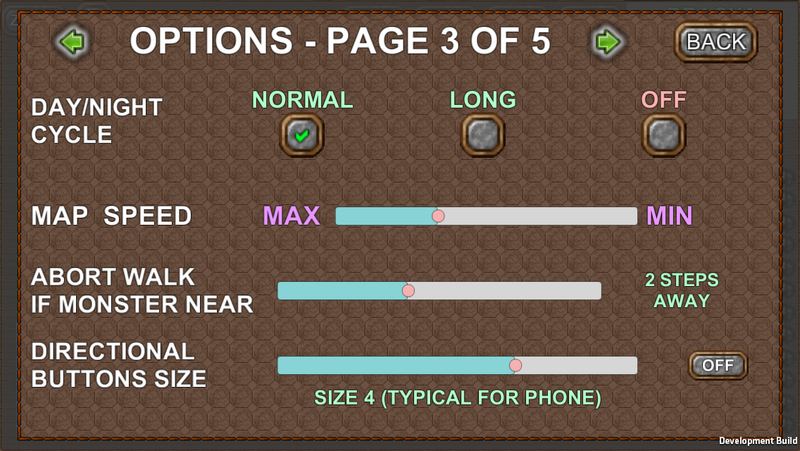 And I also put a new UI feature in whereby it chooses different sliced button images depending on screen size. Now on tablets the buttons won’t look like stretched silver plates. Another feature added: multi-spawned random maps. A normal random map gets created using randomised variants of specified characteristics. The orc lairs are a good example, they all follow the same “orc lair” design specs but differ in room count and whether a warlord is present or not (boss). 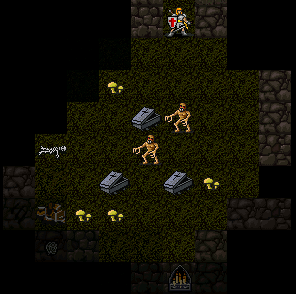 To make randomised dungeon maps even more interesting and versatile, I have added a multispawn random map feature. Essentially, an orc lair is created in detail once you enter, then when you exit and don’t come back for a while (timer A) the data gets deleted and the orc lair entrance and visual removed. Another timer (B) then starts and once finished it will create a NEW orc lair (using the same specs, but rolled afresh) in one of a list of specified locations. This way, monster lairs/dungeons pop up as new after a while once you looted/visited it. This is now implemented a new norther part of the starter island, where GNOMES inhabit the hills. Makes for fun (and endless) dungeon runs if you want to. But beware, gnomes seem like easy enemies until you stumble into some gnome mages, or even worse a legendary gnome shaman somewhere deep in their burrows… they also make ample use of secret passages so to explore their lair you need the right skill or spell. DUNGEON RUN walking mode. When active, you follow the direction, but in a simple corridor also follow it around bends and through open doors, until you hit something interesting, a monster, a dead end, or fork in the road. Now officially behind the timeline I had intended. Not thrilled. Only good thing is, it is not because of any issues encountered with the game itself, purely my private life causing some scarcity of time. 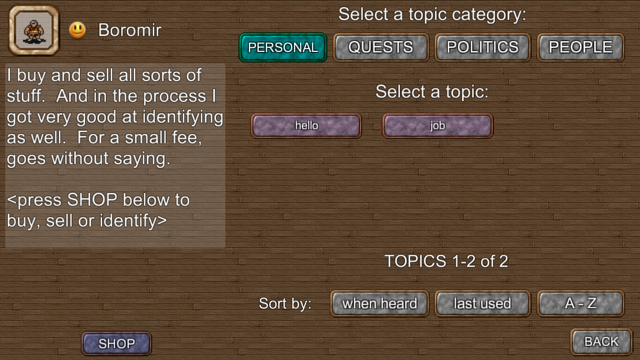 But I have added more functionalities, fixed bugs and built more content. 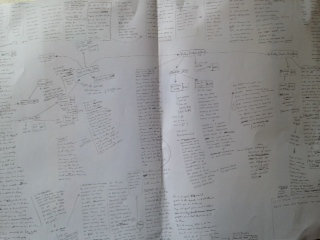 Now what was previously called Chapter1 is completed, and I am building Chapter2 maps now. Not long to go. 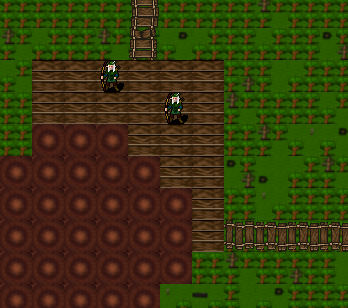 More maps completed: the village with all its NPCs, quests and shops, and the undead tomb. Also made another improvement to the game overall that did not exist in the iPad version: quests being given, completed or rewarded now trigger a notification ‘banner’ to appear, stay a few seconds, then move outside the view range again. Definitely makes for a much better experience when moving through the storyline. Help pages / tutorial, credits, links all added. Whole code scanned for “add this later” remarks and few things completed where necessary. Now I have started building the maps. 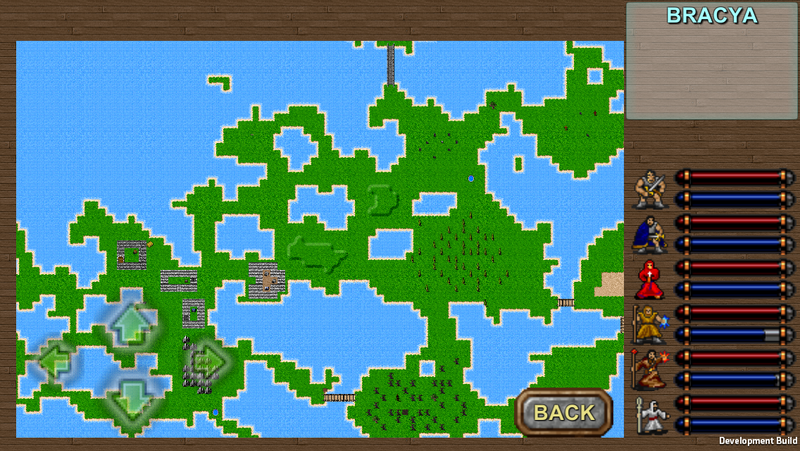 Should be fun, intending to actually expand the first island. 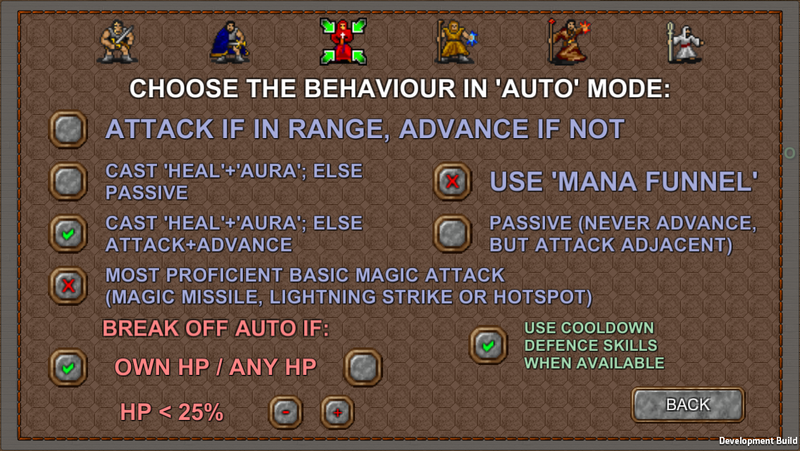 More auto fight options (the direction to use HEAL spells can now be coupled with any other tactic choice, and using magic attack spells can be set to have a mana threshold under which the player stops and saves mana for HEAL spells later). You can also now set a MARKER that is the preferred target by any auto player if in range. means you can have auto fights against a strong opponent with his minions, and ask all players to ignore the minions by placing the marker on the boss. There is now an option you can set whereby your REST default setting is either what you previously had, or daylight, or heal/recover SP+HP. makes for quicker play if you have a clear choice each time. 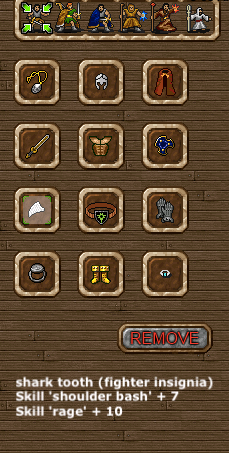 ITEMS now have intrinsic special attributes. For example a DRAGONSCALE (shield) has fire resistance, irrespective of prefix, suffix or condition of the specific instance randomly rolled. 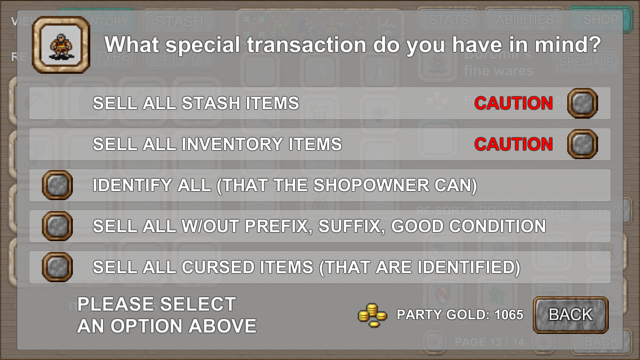 SHOP owner now has many more expensive items for you to see those in action. SNEAKING now works. there is a chance you can enter a monstergroups’ range in which it would pursue you, but the party’s combined skill can prevent them from noticing you. once you are noticed it is not re-rolled and the group stays focused on you until you leave their range. they may not run after you every turn, that depends on their level of interest. There is a message displayed when a monsters spots you and starts chasing. To boost your chance of sneaking (the skill is not that quick to increase with TP of course), you can learn and cast the DISGUISE spell. 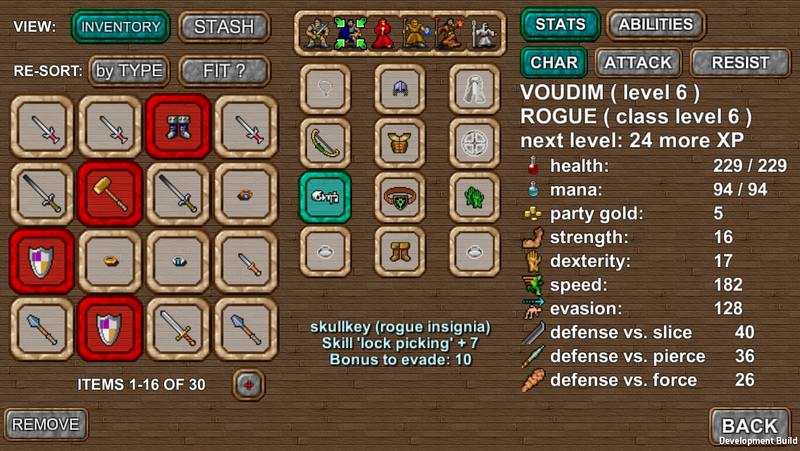 Each player class now earns class-specific bonuses each level, which vary over time. rogues and assassins will get “+1% chance to critical hit” every 3rd or 4th level for example. Interface for GUILDS is built, and I finished the engine to track and update QUESTS that relate to discovering maps or killing monsters. 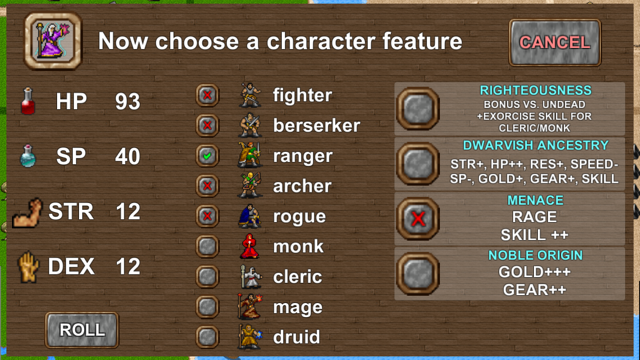 So now all is set to complete the class change functionality that comes with guilds. If I am not mistaken, then I only have to fill a few minor gaps here and there, and put the rest of the monster types in. And then it would be time to (re-)create all the maps and NPC dialogues. Close to the finish line! LIGHTING ENGINE is done, and as hoped for, in a new way with less performance drag (but also an option to switch it off or have the sun shine longer each day). Makes for good atmosphere, and together with light spell duration display is an improvement to the old game where the daynight cycle was not so pleasant. 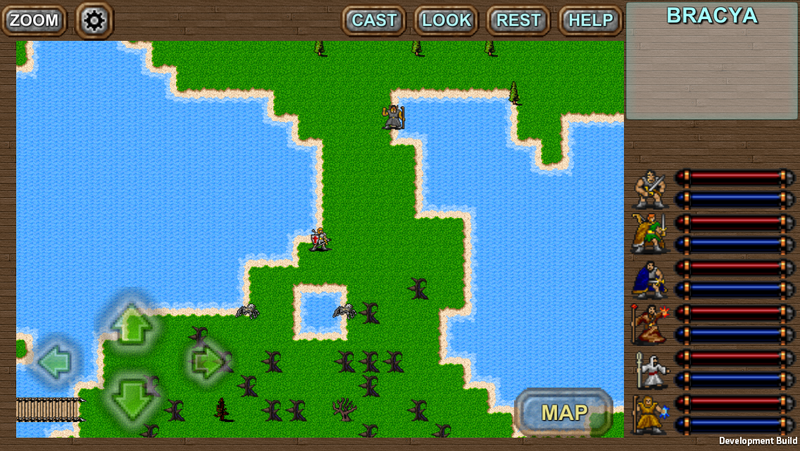 Another major (and almost last) milestone done: casting spells and using skills in MAP view is complete. You can now resurrect players, cast Light or Wizard’s Eye, and those last two also have icons showing including remaining spell duration. A nice improvement from the old game where this just abruptly stopped. Have also added randomised hints to the LOADING screens and will soon build the HELP pages which also hold history of monster kills, NPC encounters, quest status etc. Only a few features left until it is purely a matter of re-building all the maps and then it is done! Massive progress. Android works like a charm, beta testers chipping away to find whatever bugs are left, and I am making nice improvements to the engine. Main one was the introduction of one-click processing of OPEN, TALK and USE commands. 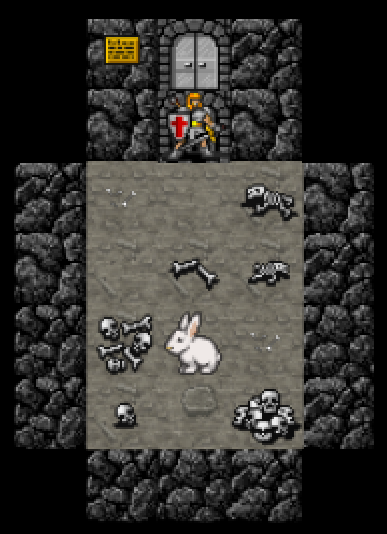 basically if you are next to a door or chest, an animated OPEN mark is shown on the tile and if you click it, it is like using the respective button. In the old iPad DoC it was even worse, you had to click the button AND select the tile. 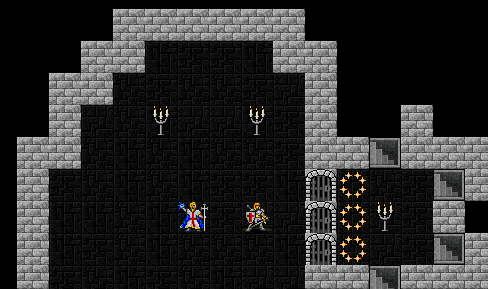 Random dungeons now work beautifully. After a lot of work though. Translating pathfinding and procedural content generation routines that were at the edge of my abilities into C# has proven to be a big consumer of time. But now it is done. And I will make more use of it in DoC and it should make for even more replay value. 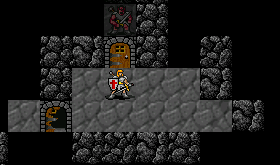 Spending a LOT of time on the random dungeon creation routines, making them more bug proof and stable in the process. I have posted an overview of general outstanding steps HERE, and would like to reiterate that if anyone is eager to playtest the beta, just send me an email to dungeonsofchaos [ at ] gmail.com. I will set up Testflight for iOS testing this week, and will also soon jump into the cold water and build from Unity for Android (have not tried it yet, is supposed to work though). Lot of remaining functionality now done, and many improve upon the original iPad game. 5 pages of options and customisations, better fight AI, more intuitive monster knowledge, detailed fight statistics, better fight warnings, easy pre-fight auto settings, COMPARE loot and shop items to your equipment etc. 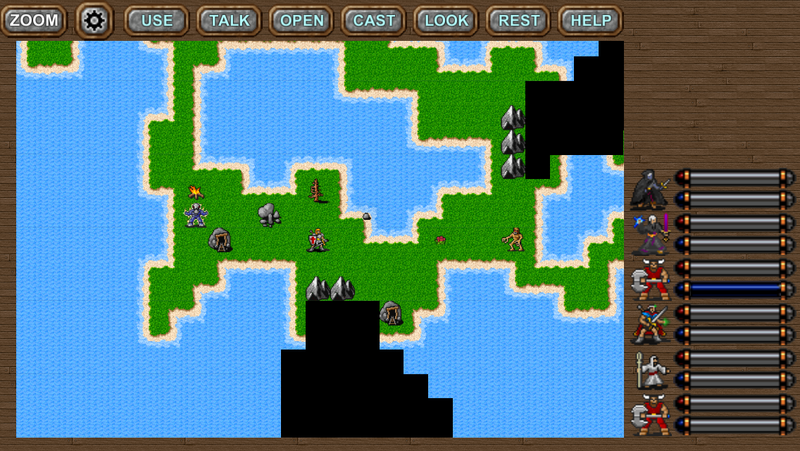 Progressing very well adding more functionality, autofights, quickaction selection, leveling up, training, minimap, zoom. All done. Very soon it will be down to the content, and then onto some serious testing and fine-tuning and seeking to approve the visual appeal and user interface. 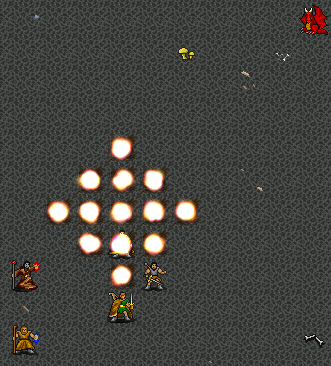 A long awaited feature is now included in the Unity version: projectiles. Magic missiles or arrows now fly from shooter to target, and there is also damage (or ‘miss’) text display appearing on the target, which makes for a much more interactive fight experience. After a lot of work, and a small holiday break, am now playing the alpha version on my iPhone. Struggling with some Unity issues at the moment, first time objects become visible it lags. Seems to be an ultra common problem, now I just need to mirror one of the many workarounds people use. I am more and more thinking that auto-fight is the predominant way to play out fights, so I am currently also investing more time into making that more sophisticated and user friendly. Exploring (in zoomed in mode) is definitely as enjoyable as in the iPad version. In regards to release date, I have to get my bearings on what needs to be done from here, but I would have to say end of February is most likely. 9. 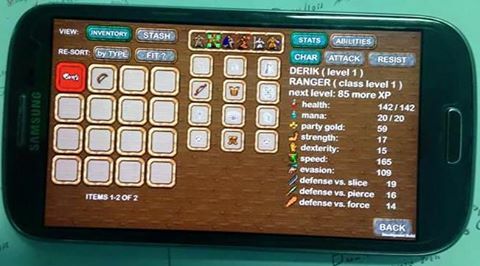 ZOOMED-IN view, more details on smaller screens. full functionality and movement in either zoomed mode. 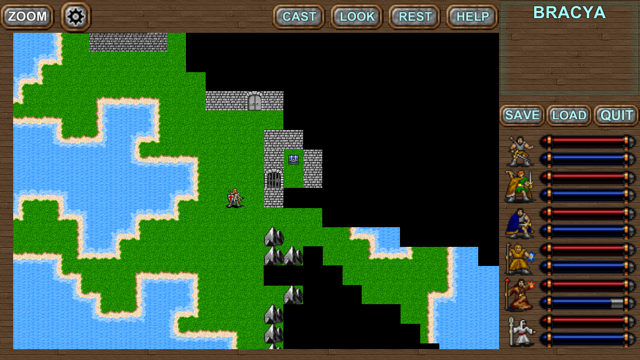 I am now busy adding more of the game engine: quests, quest triggers, random maps, etc. At this stage it may be possible to launch the game in January, fingers crossed! Something I also wanted to post is the following. Note, this is border-line SPOILER in terms of the current game. But most of these will be implemented in slightly different form in the new game, so I may as well. there are HEAPS of dragons where the warrior tells you to go look for one. the deeper you get into the cave, the more powerful they are. Unity port developing nicely. In terms of UI, to make it phone-friendly, I am trying a minimalistic approach and also include a ZOOM function. 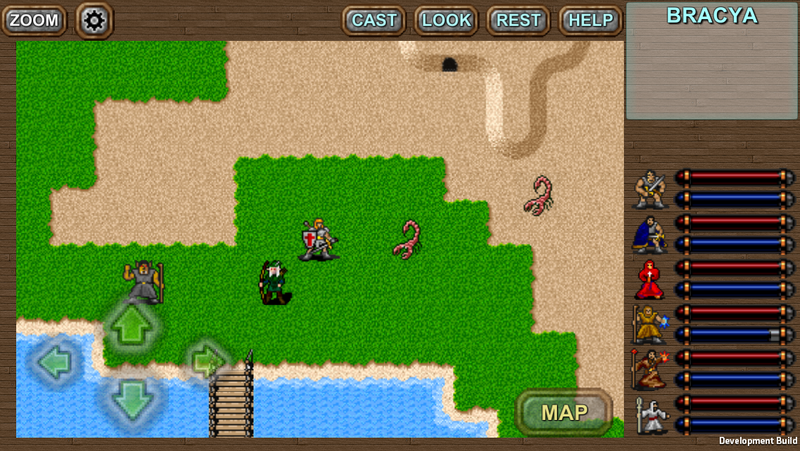 so far I find it very manageable to see detail on iPhone-sized screen, and hit specific tiles accurately. Advancing my 2nd game with tremendous speed. Will open up a separate wordpress blog in about 2 weeks, with some previews. It is built in Unity so will come to all iOS and Android tablets, phones and whatever else has a screen of at lest 640×400. Expanded savegameslots from 3 to 9. Upon fan request, to try out various party builds without having to overwrite. “Kratos’ heart” ARTEFACT and related functionality is almost finished. I will also expand the savegame slots to 6. Expect to submit 2.1.2 on the weekend. Fingers crossed Apple will review it quickly again. Don’t want to make it too powerful. However I just noted the H and H+ auto fight option icons are not showing on retina devices, however this is a display problem only and the options itself work fine. – HEAL and HEAL+ fight auto actions. These feel great, I have enjoyed them myself for a while now, and 2.0.5 is with Apple for review which will bring it to your iPad in a few days (~ 8 July is my guess). – significant performance improvements in terms of walking speed in large maps and dungeons. Only now that parties have accumulated a lot of knowledge (number of monster spawners activated etc. ), did some issues come to light where I have coded the engine in a sub-optimal way (nice way to say ‘dirty coding’). Fixed in 2.0.5. 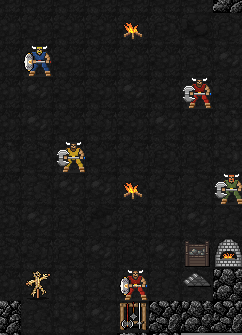 – Since 2.0.5 is already submitted, I am now working on 2.1.0, which brings a content update: BERSERKERS! They had been busy tracking down a mob in a mine, when the evil hordes arrived and something strange happened down in the mine as well, leading them to turn from the hunters to the hunted. They just escaped and broke free, and they can help your party (let your barbarian advance to a berserker) if you help them… Berserkers have a unique skill that over the course of their ‘career’ let them become immune to STUN effects (those caused by force, not paralyse effects). Which makes them a different kind of fighter when it comes to opponents like minotaurs or mercenaries, which can otherwise wrack havoc to your melee fighters. 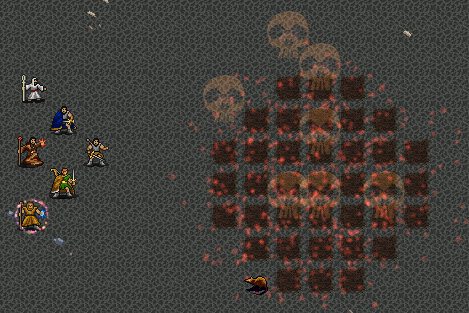 – Maybe in 2.1.0, maybe a bit later, I will add some sort of teleportation spell. A simpler one than the one that archmage Parnosz uses. One where you set a beacon and can return to it later. Or maybe several. Or maybe you have to find/earn beacons and each additional one lets you keep another portal open. Or maybe beacons can only be used once and you have to re-earn them… we will see. Chapter2 is now released !! It is done! I have spent HOURS testing the end sequence, fixed a few bugs I didn’t even know existed, and made a small attempt at balancing things. Balancing is really something to be enhanced over the next weeks. 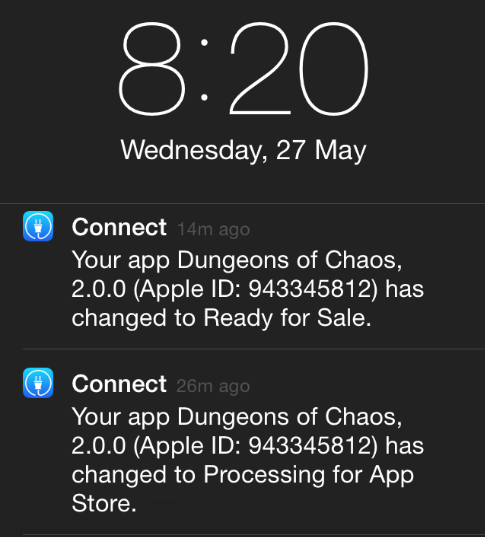 But for now … the Chapter 2 update is with Apple for review! Quite a few things, as last time, that I put aside because it would take too long to include. Would probably have loved to add more skills and spells, but I can add them later still, like the shipwreck quest added features to Chapter1. ** update ** just finished 4 hours of play testing, and I am very pleases that only minor things needed fixing. Also built up everything for the end fight. So what is left for tomorrow is a good end sequence that leaves the player with a sense of accomplishment, and some way to continue with future story expansions. Made great progress on the remaining storyline steps and bringing the areas to life. The quest to be accepted into the geomancer’s guild will involve venturing to many different places and find ancient stone monuments, which really enriches the exploration experience. And the rewards are worth it! But ultimately these are SIDE quests as the player can follow the main storyline at his own pace and confront the arch enemies comparatively quickly if he does not feel the need to reap the benefits of all the side quests and advanced player class guilds. I am very excited to show this to the world soon! a) making the minimap scrollable. Filling all the gaps, today mostly some randomised dungeons with not-too hard mobs and ability to grind for loot and XP. Ember orcs in the example below, a more sinister form of orc. They also once stole something precious to the priests, so a guild quest also makes you go down their caves. 2. Holy Avenger party status, and quite a long duration. A buff to all fighting attributes. 3. Holy Curse. A major debuff to all enemies. 4. Holy Wrath. Crushing damage to all enemies. Those that survive, receive a massive stun effect. 5. Holy Fire. Massive fire and vs.undead damage to all enemies. 6. Holy Angel. Not implemented yet: An angel materialises and fights on your side. The higher the level of DIVINE FAVOR, the more likely the higher level outcomes become. But if you are severely wounded, the Holy Aid is most likely chosen by the deity. Weaving the nets … I have completed the main storyline (except end battles), and have built a lot of side quests as well. Not just battle-based, I have just finished one that is quite intricate and hard compared to other quests, and largely does not require fighting. It does however interweave with other quests that do, so it will actually form a nice side-thread that spans throughout the story. These are the things I want to get right, and I am quite happy how this one turned out (it is the ‘pub’ quest, if you need to know…). Been heavily filling in all the gaps for Chaper2. Populating all the NPCs in the elf city, setting up a raided river village/city with villain… evil boss/quest monster to get access to the marksmen guild. All sorts of individually little things. but it is coming together. Am also formally putting my list together of things that will and will not make it into chapter2. touch choices, not unlike the ones I had to make up to the Dec-14 release of Chapter1. Never easy to put on hold a functionality I really see benefit it, but time matters. Can’t polish the game forever without giving people a playable update. Jaimar will allow the player access to the wizards guild, quite an important step to beef up the party’s magic abilities. If you can save him from the perils he got himself in that is. Ryld is a dangerous villain. When the party asked to get access to the assassins’ guild, he was chosen as the required ‘proof of proficiency’. Good news: I think Chapter 2 is about 80% finished. I played through the first half of it and fixed up little things here and there, clocking up the equivalent of (without cheats) at least 10 hours playtime. So I am happy with the extent of content, and will finish a few things in the last half over the next 2 weeks. More NPCs and guilds being built. Knight, Priest, Warrior, Wizard … a few good options each with their own ‘admission’ quest now in place. Just be aware that there are choices to be made, once you choose an advanced class you cannot revert back. You will most likely be torn between Wizard (more theoretical and frail) and Warlock (hands-on), as well as Priest vs. Exorcist, and Warrior vs. Knight. They are really similar to your choices during party creation, where monk/rogue/druid/archer seem like a bit too specialised, but actually provide a good flavour and skill set to a party. If you enjoy they way these change the tactics, there is definitely replay value there for you. Advanced classes drift apart even more. If you want to maximise a lot of spells and see what a level 10+ ‘magic rupture’ spell can do, you need to go down the WIZARD path and ultimately (later) become and ARCHMAGE. But that comes at a price, a WARLOCK cannot become an ARCHMAGE but may feel a bit more versatile due to his combat abilities. Hope this adds interesting depth and replay value. Not visually exciting, but this marks a major step and something crucial to Chapter 2: class upgrades. Because as much as I allow the players to wander freely and choose their fate, the ability to adopt a more advanced class and really master new as well as the old skills and spells, only now becomes available. It may be a small impact to start with, but once you cast a level 10 fireball or use a level 10 exorcise skill, you will know the power that is unleashed here. One of the few remaining technical additions is coming to life: GUILDS. They will all have a quest that grants you ‘access’ itself, meaning you will then be allowed to upgrade certain players to that class. But from there the guilds will differ: all offer additional quests, but the rewards will differ (access to a shop, access to a locked map location, item rewards, artefacts etc.). Been focussed on building/connecting the storylines and NPCs. Another element taking longer than I hoped. I have also been distracted with App updates to deal with 2 bugs. All out of the way now. Another item that has kept me busy is the continued call for an iPhone port. 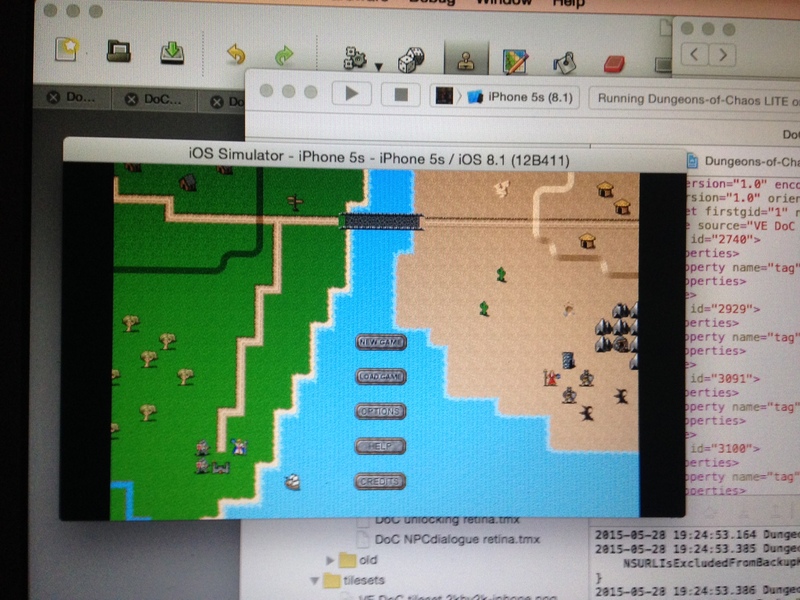 I have spend some time this week building a ‘feasibility study’ for an iPhone port. I think it can work, with a revised UI and smaller view, but retaining all content elements as they are (the fights may feel different but I aim to keep all spells and range factors same). v 1.3.0 is available for download! Which adds he SHIPWRECK bonus mission to Chapter1, see UPDATE section for details. 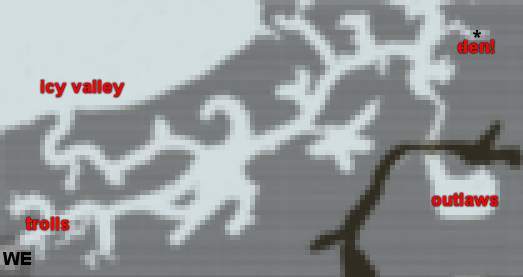 Have finished the Beholder Abyss (part of Chapter2, just for clarification). some good loot and grinding opportunities there. There are lots of one-off random finds, and the beholders that spawn indefinitely out of the abyss will rarely but surely drop various spell books, so for those of you who want to make your spellcasters more powerful this is a place to hang out. Hard to estimate when Chapter2 will be finished, I am trying to uphold the depth and quality of the content and it really takes longer than expected. Not progressing as fast as I want. Also just noted that the HELP fight function looks a bit odd on retina, text is off-centre. Forgive me for that, will fix in 1.3.2. Not worthy holding up the 1.3.0 release for that. I have revamped the vs. undead damage concept and the EXORCISE skill. They were not very useful against incorporeal undeads (ghost, spectre) but ok against bodied undeads (zombie, lich). In essence you had a really hard time to hurt them even with EXORCISE or 200% vs. undead bonus. fixed that. will be in 1.3.2. Essentially now they are still IMMUNE to normal physical attacks, and physical attacks with low ‘vs. undead’ bonus do very little. However if your bonus is over 100% (not too hard to do. EXORCISE has about 160%+ 60% per skill level so minimum of 220%), the physical immunity vanishes very abruptly as your weapon/attack is essentially divine/ethereal. With a bonus of over 200% the target is basically without the incorporeal bonus, which means they are without any armor at all and hurt a lot. between 100% and 200% bonus the effect is scaled, so you do quite a bit of damage. And incorporeal beings don’t have a lot of hitpoints as they rely on their immunities. However EXORCISE effect is lower the higher your difficulty setting. Just another update in regards to the bonus mission. I am using it to also introduce the concept of insignia, you can get some insignia for your basic (current) classes and try them out. They are specifically designed to also give you access to some rare or new(!) spells and skills. Enjoy! 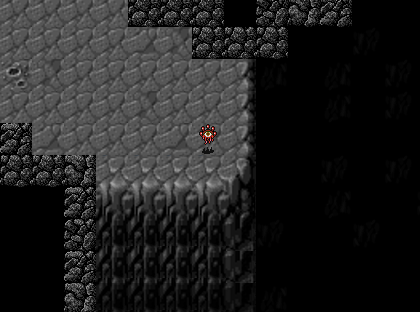 In terms of Chapter2, am working on a dragon ‘cave’. More like a dragon community. You can venture deep enough to find not just the type of young dragon that exists in Chapter1, but mature ones, elder dragons … and even nastier/more ancient varieties. Elder dragons are tough, you need really high fire resistance to front those (see below). And even more advanced dragons employ a variety of magic as well, so fire and massive physical damage won’t be the only problems once you approach for example a great dragon or an ancient dragon. I intend to make these side-quest relevant, for example for superior rewards from the knight’s guild. It is done. Feels good to submit something the fans can play right away. A little glimpse of one of the shipwreck decks as a teaser below. 1.3.0 should be coming out of Apple review phase in a week hopefully. The shipwreck is a bonus mission, available if you have at least completed the orc warlord quest/deed. A shipwreck and survivor can be found southeast of the shelter/cave then. – TALK, OPEN, USE, SHOP button now executes on first click if there is only one possible target. No change for LOOK because LOOK has a passive (ranged) and active (close by) functionality. 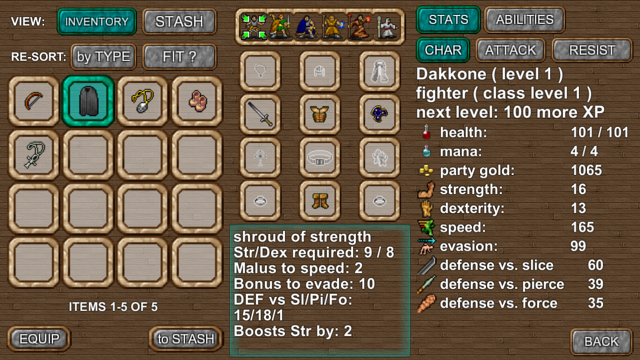 – changed the way you gain skill and spell levels just by using them. was way to hard/slow due to some rounding issues in my formulas. Basically each skill and spell as a number of repeats now you need to reach to advance your proficiency by 1. That depends by skill and spell. For an auto-used skill like ‘SPRINT’ this can be a high as 45. For some spells it is as low as 10. For every 10 proficiency increments (= ~ 1 spell level for example) this gets 20% longer. So to go from spell proficiency 1 (= level 1) to spell proficiency 21 (= level 3) you need 10+10+10+10+10+10+10+10+12+12+12+12+12+12+12+12+12+12+12+14 uses. Feel free to grind away but really the game is set up so that you can use talent points where you want to focus on. – and when I submit 1.3.0, I will try to add a bonus mission for those of you who have been waiting long for additional content. Currently thinking of having a shipwrecked person show up in the cave, saying he deliberately crashed his boat as fast as he could into the coast to get off, as it is infected by some nasties… which you can locate and raid. He/it will appear as long as you have already completed the orc warlord quest. Party will be teleported back to the castle cellars. meet Lord Aldrich. 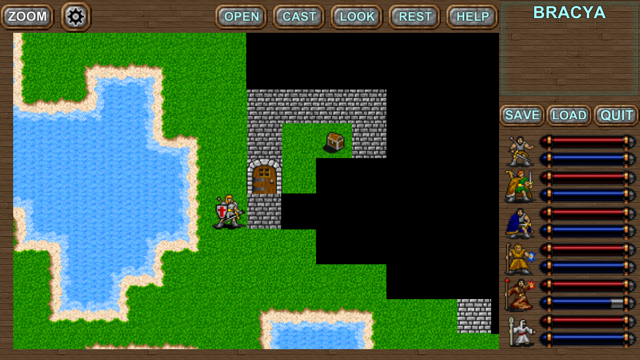 Castle cellars has various NPCs, 3 guilds you can use to advance player classes, and 2 shops. Various side quests from guilds and also others, and random dungeons that are infinite in number for those that just want to grind. One ‘main’ side quest takes you down into the depth with a huge map and some nasties. Opens up a 4th guild NPC. Then you get access to the icy valley, some side missions and dungeons, some random dungeons, a vast map to explore. That takes you to an outlaw village, NPCs, very nice shop, storyline quests. One guild you can unlock, some guild related sidequests. Main storyline progresses by you being allowed into the mountain path, but not yet the valley itself. Mountain path contains main storyline ‘keep’ full of minotaurs. various random dungeons, things to discover, vast map. the lot. Once successful you are allowed to enter the northern part of the valley. You touch base with lord Aldrich and are asked to meet the Elfes. Valley is again a huge map. Has the elf forest, a swamp, various other stuff. will place some goodies to explore/find. Elf forest has entrance to the elf city in the sky. visually nice. various NPCs. One guild to unlock, with quests. will place some other side quests and stories, some of which will only start and continue in Chapter3. You get some insight and are asked to meet the druids. Swamp has the druid’s cove. One guild to unlock, some side quests. Some main storyline fights, then End of Chapter2. Playtime if you rush it: 10 hours minimum I’d say. If you explore it all, unlock all guilds and guild benefits, but minimal grinding: hard to say, 50 hours at least I’d say. It feels tough to exclude ideas and content from Chapter2 but it is a question of time now, I want to deliver to you fans out there who are waiting for more. Given the size/playtime I think no-one will be disappointed. Remaining concern really is how much time I can spend to balance things. Monster strength, classes etc. More spells! I am quite enjoying this, the outcome is very visual. And rat-destroying. IGNITE is a spell that hits all foes, instead of large damage upfront it deals damage over time by setting them on fire. nice to clear out minions, even orcs if you stack a few spells on top of each other. BALL OF LIGHTNING. does what it promises. area effect lightning damage and paralyse chance. at higher levels quite a blast. bigger even at very high levels than a fireball. it is really the quicker option of what otherwise means casting 10 lightning strikes at folks. Most of the spells I am doing right now are really emphasising the “DPS” (damage per second = throughput) aspects of spells. You can choose to deplete your spell points in a quick and powerful way. If you are facing several fights before you can rest again, this means a tactical decision how you approach each fight. What I found from testing this out is that it is quite enjoyable to have the option to cast this, but trying first to preserve spell points. Then when some enemies are just a bit too tough to defeat in an efficient way, you say “F* it” and blast them away with a powerful spell. It is fun to be ‘wasting’ spell points to show off the power of a spell caster. Now off to create some powerful daily skills, to achieve the same for non-magic classes. Takes some careful consideration. HERE is a blog post about which ones I am considering, and the list will be expanded over the following days. a) the impact (to HP as well as curing some poison, bleeding and stun effect) greatly depends on the distance between the caster and the player. Not trying to give too much away but at spell level 1, adjacent players get 80% effect, players (4/4) away from the caster get 22%. At spell level 5, this changes to 90% and 30%. The effect is generally strong, however due to the distance factor it means you have to trade off exposing the caster to some risk to make it work fully. c) it costs a lot of spell points. At higher spell levels it actually starts to cost LESS. So basically it is powerful if you tactically employ it wisely. And definitely worth investing if you are a priest, as it can mean supporting the front-line fighters in a tough long fight. Why are only priests really good at this? Simple answer: so that priests are worth having in your party. The LOWERED spell costs and INCREASED effect at higher spell levels means this spell gains a cumulative ~30% value/spellpoints with each level. A standard cleric at end of Chapter1 would have enough spell points to cast this twice. But a priest if he invests talent points in it, will later in the game be able to use the same amount of spell points to cast it 4 times, and with about double the output. Have taken a good look at what I have built so far vs. what I want to built overall and made some decisions, you can read the detail HERE. Essentially I need to make sure my ambitions for Chapter2 are not too big, else I won’t be able to release in my desired timeframe. I am really wondering what strength the party of the average user is. Some of you may be grinding, others may not. Anyone interest to share their status, would you mind sending me a screenshot of each of your 6 players’ STATS screen? You can email it to dungeonsofchaos @ gmail.com. I am expecting people to be about level 13 when they end Chapter1, but how beefed up their stats are via equipment, or how much people levelled up beyond that, is really not clear to me at this stage. 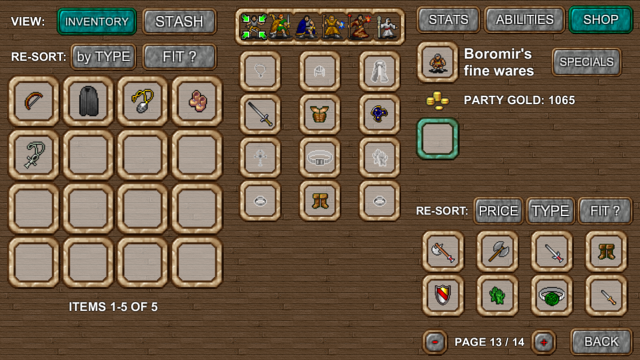 If you feel that any particular SPELL or SKILL investment you made also makes a player in your party stand out, a screenshot of that would be also be useful. Share any other insight or feedback you have, now is the time! IF you find the highest difficulty level too easy etc., I can still tweak that even for 1.2.7 release in the next days, but definitely for wide-ranging monster design elements for Chapter2 as well. simplified the skill/spell proficiency needed to reach the next level. now basically in steps of 10. due to insignia, maximum skill or spell level, where applicable, is now 16. 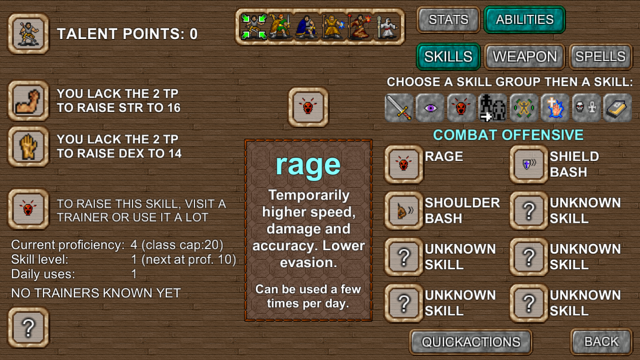 Without insignia, a character can reach a skill/spell level relevant for its class, for example level 6 RAGE is the maximum for a barbarian as his proficiency is capped at 55. A berserker can reach level 9 RAGE with a proficiency cap of 80. Each of them could however find/obtain insignia that boost the skill. To boost it by 1,2 or even 3 levels is common (proficiency up to +30). More than that would be VERY rare but also possible. 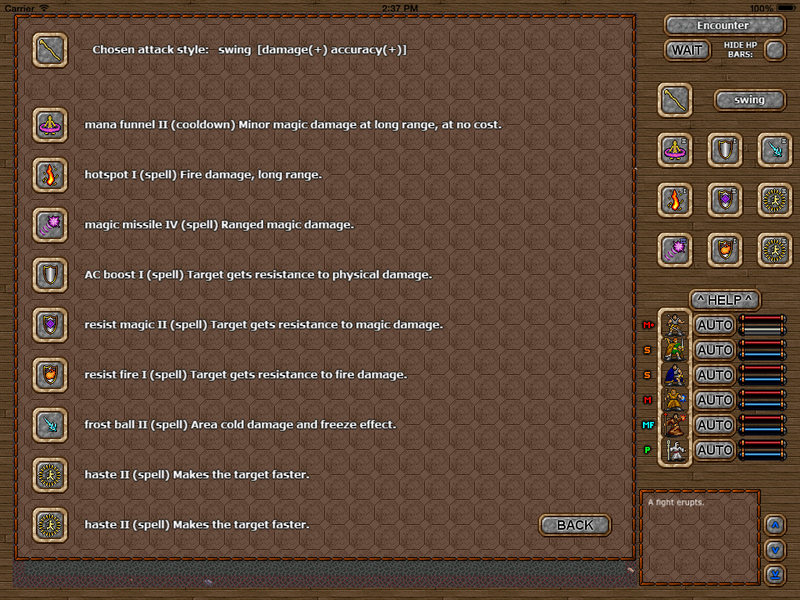 Each spell and skill effect is now defined up to level 16. The dragons will be incrementally MUCH more difficulty to defeat, so I will either leave them as self-induced challenges or I will link them to supplementary rewards (insignia?) from the KNIGHT guild. c) more spells! MAGIC RUPTURE provides ongoing magic damage to all foes, but renders the mage immobile in the process as he shields his friends from it. SMITE is a magical way for a monk or exorcist to boost their melee damage versus undead. 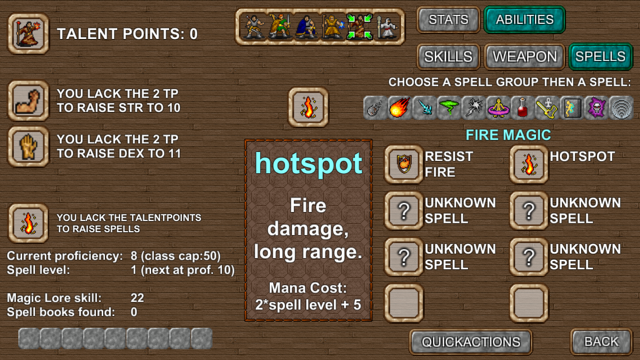 Am also fine-tuning a few of the existing spells and skills. HOLY CHANT now does ongoing damage do undead while it lasts, even at lower levels. And it works properly now. d) you can now find MAPS. some will be crudely drawn, some detailed. They will closely resemble the real world and be either found or given by NPCs. They will be accessible in the HELP menu from the party screen. e) simplified the skill/spell proficiency needed to reach the next level. now basically in steps of 10. due to insignia, maximum skill or spell level, where applicable, is now 16. 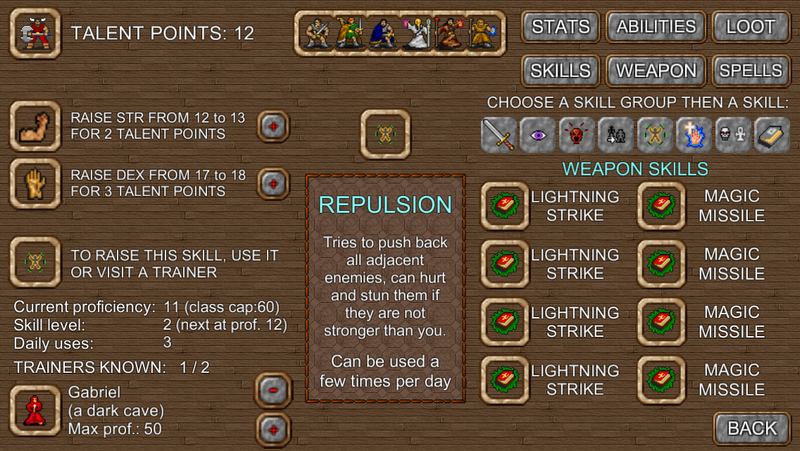 Without insignia, a character can reach a skill/spell level relevant for its class, for example level 6 RAGE is the maximum for a barbarian as his proficiency is capped at 55. A berserker can reach level 9 RAGE with a proficiency cap of 80. Each of them could however find/obtain insignia that boost the skill. To boost it by 1,2 or even 3 levels is common (proficiency up to +30). More than that would be VERY rare but also possible. Each spell and skill effect is now defined up to level 16. It does not look like I will finish Chapter2 in less than ~5 weeks I think, still a lot to do because I designed a story and it turns out that all the locations and detail to be filled in costs a bit more time than I thought. Thanks for waiting everyone, it is well worth it if you liked Chapter1. My guess is that Chapter2 adds at least 3 times more playtime, and should also be more challenging. the type of boosts can be fixed for specific item drops, or set in random parameter ranges, with are specific by player/insignia class. For each class (like ‘monk’) I have defined what skills and spells are deemed relevant and with what comparative probability. For example ‘unarmed’ combat skill is quite likely for a monk to be chosen. ‘Exorcise’ is a rare one. Many others have zero chance: ranged attacks, 2h axe, lots of the spells etc. So there is ability for a lot of random drops that still make sense and allow for some loot grinding if you so choose to. Insignias provide a very powerful customisation element because you may get a spell that otherwise you just could not find a spell book for, or you can lift a skill or spell proficiency beyond a characters’ natural maximum limit (no limits apply to the boost). Up to now all skill and spell impacts are defined for a proficiency level of up to 100. Now I will increase that to allow for insignia-boosted characters to get impacts that are not achievable by other means. Given this allows for some serious min-maxing, I will make the higher difficulty levels tougher so that there remains a challenge for those aiming to have ‘the best’ character builds. For normal difficulty, min-maxing will not be a requirement to prevail. Question to the audience: should fire ball and frost ball hurt players in the blast? Reason says yes, but I think the game would work either way, just have to factor in the powerfulness of the spell if the answer is NO. Problem/reason I have with YES: then it would be really bad if you mis-touched the target tile or if you simply had no idea how powerful your fireball is (=radius). So I think I will stick with NO, just enemies get hurt. Similar to the SPIN multi-target attack. A lot of content coming together. Big side quest finished that can easily take 1 to 4 hours of gameplay. Includes a few interesting monster challenges. ‘Vampire’ is a very broad concept and required a few decisions as to what that means in my game. Life stealing is the biggest feature, and it really does make it a bit challenging to have a creature that negates a significant portion of damage by just replenishing its health by damaging you. ‘Trolls’ is another one of those names that can mean a lot of things. I have decided to see a ‘troll’ like a massive melee based fighter with a lot of strength, but also fast regeneration abilities. But feels quite different to a vampire of course. Also created a type of slime/blob beast that uses poison in both direct and gas form, quite tough to keep your party alive if not prepared for that. Hoping that these fight challenges will add depth to the tactical part of the game. Of course the content includes vast locations, secrets and treasures as well. Also now activating the FIRE BALL spell, meaning the party can find a book to teach them about it (if their magic lore is high enough). 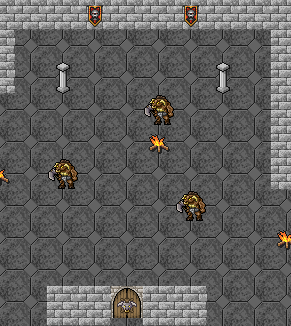 Putting monsters in now, trying to make it challenging at least tactically. This ice demon for example is pretty good with its area effect frost ball and when you come too close his ice breath is also a problem. Really need to approach this fight with the right resistance boosts in your chosen equipment. The frost ball also changes the battle arena visually. Will do the same for fire balls soon. The level under the castle is finished. Shop, Lord Aldrich, knights etc. almost done. Levels opening up from here: CATACOMBS and off-shoots (built but needs a bit more tweaking), ICE PLAINS (built, just need some gimmicks and monsters), random mountain TUNNELS (to be defined yet, to allow for some additional grinding or exploring. I like making random dungeon generation configurations however always cautious if any bugs are encountered along the way). 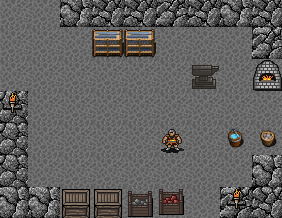 Tonight I will link up the outlaw camp (90% done but now need to make the NPC data), troll cave (basic layout done), dragon cave (tbc, not sure I want it there actually). Anything added at the moment is really progressing noticeably so it feels quite rewarding to see it come together. The though decisions about where to take the story are mostly done. New functionality added in terms of monster capabilities. 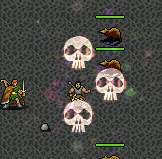 Monster behaviours can now incorporate area effects / blasts / bursts and suicide as well. 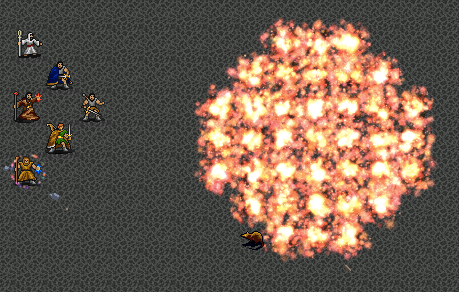 My monster engine can therefore now simulate something along the lines of bombs: a non-moving entity spawned by a monster, using the blast action after a set period of time, then dying immediately. Looks, feels, hurts like a bomb. More details HERE. Comes in the following flavours: fire, cold (+freeze effect), gas, lightning. 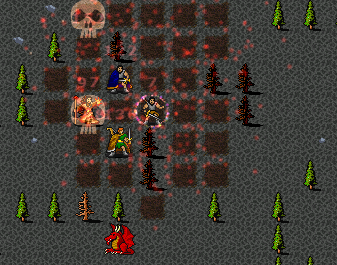 I gave this feature to a creature in Chapter2 and it makes for great tactical fun because you may not want to keep your fighter right in front of the enemy if that enemy puts a bomb next to you… or in more RPG-style terms, an incorporeal being summoning an exploding orb next to your characters from a distance (every few seconds) really keeps you on your toes. Alternative use: boss slime monster in the swamp, spawns little green bubbles that, when bursting, cause an area poison effect. Have also added the concept of a supporting monster. One particular new monster summons what looks like a whirlwind, and these do not damage you and very quickly approach you and paralyse you over and over again. So choosing whether to take out the annoying support acts or the main culprit will be important. 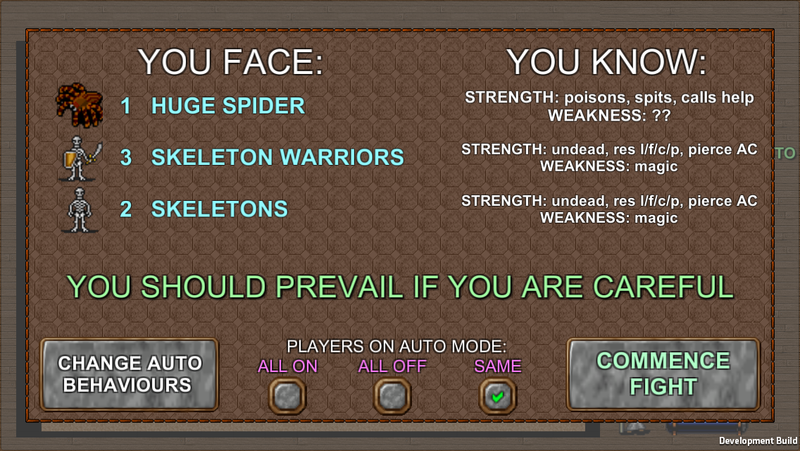 Also working on more nasty target selection for monsters, maybe at least for higher difficulty settings. If you know which monster to focus on first before targeting the rest, why should an intelligent tactical enemy not focus all their firepower on your flimsy cleric first? or your ranged attackers maybe? The detailed work has begun. The party is now teleported back to where the trouble started. Albeit not without a few hiccups along the way as well. If you get the advice not to engage one of these, heed it! Chapter2 will generally have much less easy fights, most common enemies have some nasty powers that lets them curse, spawn, teleport etc., so a lot more fights will feel like the boss fights from Chapter1. out of the HUGE location maps of which there will probably be at least 6 (Chapter 1 had just one), I have finished the third today pretty much. Unfortunately to show any of that would not be good. But let’s just say the trip towards what I call the ‘valley’, which is the mainland where the trouble started as shown in the intro movie sequence, is now complete. And in the valley there are several important sub-locations with their own occupants, quests, threats. 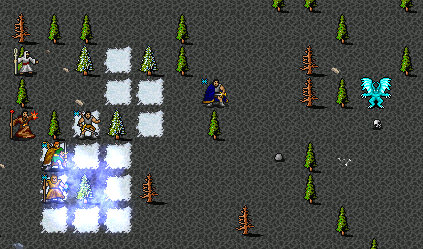 a) mountain pass and icy plains, includes trolls and that path to a settlement in the mountains. will add some random stuff like caves or old mines as well later. c) the mountain slopes leading to the valley, includes entry to castle with minotaurs and some ancient icy caves. f) elven treetop city is built. 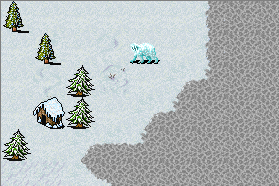 1st impression: ICY PLAINS, will be used in the mountains in the new area (back to where the assault started), but also in the elemental plane of COLD which may be added later in the game. Second impression, ELF FORT HIGH IN THE TREES. Speaks for itself. Blurred view on the forest below. thanks! Good to hear. 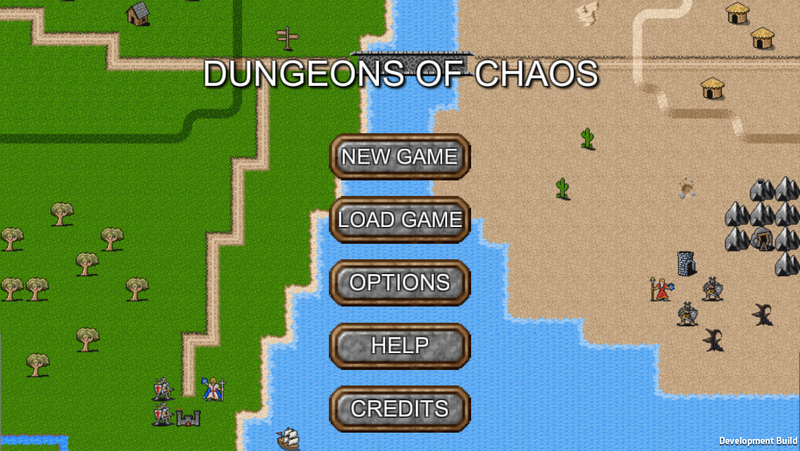 Feel free to email me details about any glitches to dungeonsofchaos @ gmail.com . And always grateful if people leave an AppStore rating and review as well. EDIT: there are more monsters in Chapter2 throwing area effect and other spells at you so the benefit is not one-sided. Sounds like you have had loads of amazing effort put into the game ! As well as incorporating various ideas or feedback from gamers. Well done. I hope at the end of it you will be satisfied and proud of your project. I m actually reading this to see of theres anything added to game since I stopped awhile back. I remember lots of empty frozen tundra or underground tunnels in the mountains on the isle of bracya. That eventually lead to dead ends or nothing. Maybe a druid monolith or something. I’d thought initially its props for later content but after browsing through your logs here, it seems it would remain that way. It seems a ill odd as my gaming experience largely dictated that a long hidden passage usually lead to goodies or rude death for the erstwhile adventurer hah. There are a few barren places in Chapter1, there are also a few in Chapter2. But in each there is lots of noticeable content as well as hidden gems. The shipwreck was added before v2. In 1.3.2 I think. it appears southeast of the shelter if you have completed the orc warlord quest. 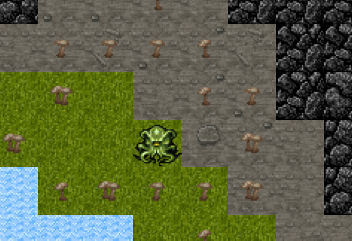 Chapter2 is FULL of new maps, monsters and NPCs and things, you will like it I think. Are all the new classes available? Would like to try the warlock and archmage ones. Thank you for all you have done. Great game!!! At present (iPad version), I have left a few classes unaccessible, such as samurai, warlock, archmage, champion/avatar (can’t decide how to call the last one yet). Originally I had anticipated that my next step is Chapter3, where the storyline develops and you will get access to more skills and spells and classes. However at present I have moved all my effort to the Unity port of the game. In the process, I am making many improvements and hence I will not update the iPad-only version. But realistically I will probably not achieve all of them in one go. Because the warlock, archmage and champion are very advanced classes, they would only become active once I advance the storyline beyond chapter2. or possibly make the chapter2 in the Unity port bigger than it was in the current game. So while there is hope, switching on all classes is not my priority. Any updated Sneakpeaks for Chapter 3? Also, you weren’t lying about how rare that Gnome Shaman is, lol. Soon. I am posting in Facebook by end of week what I have as potential expansion stuff and how I will go about it.